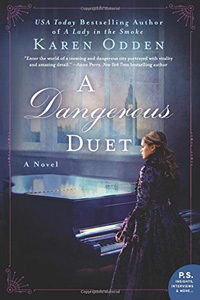 A Dangerous Duet by Karen Odden: Synopsis and Online Purchase Options. Synopsis (from the publisher): Nineteen-year-old Nell Hallam lives in a modest corner of Mayfair with her brother Matthew, an inspector at Scotland Yard. An exceptionally talented pianist, she aspires to attend the Royal Academy; but with tuition beyond their means, Nell sets out to earn the money herself—by playing piano in a popular Soho music hall. And the fact that she will have to disguise herself as a man and slip out at night to do it doesn’t deter her.